Tunisia had been under control of various outside powers for many thousands of years, such as the Romans. Then, later, the Ottomans. Coming from Turkey, the Bey family governed Tunisia, and gained virtual independence from the Ottoman Empire. 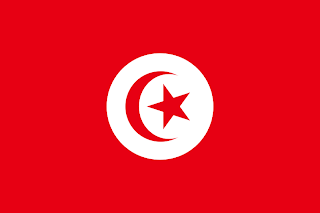 The Ottoman Empire flew many flags over Tunisia. Starting out with a banner with 5 stripes, blue on the outside, a single green in the middle, and 2 red. This banner was curved around the fly. 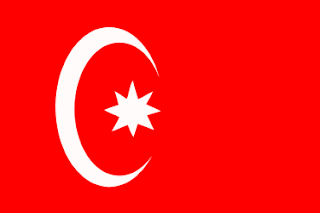 Later, the Ottoman navy flew a red banner with a white crescent in the fly, and an eight pointed star. This banner is widely credited with being the inspiration for many flags in today's Arabic world, such as Turkey, and today's Tunisian flag. The Bey family had its own banner to fly over Tunisia. 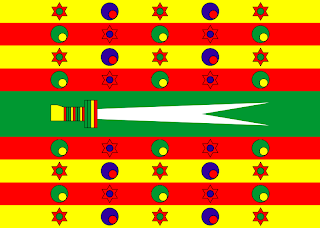 A central green stripe running horizontally, with 4 red and yellow stripes above, and the same pattern below. On each stripe where 5 symbols. A red star with a green disc, a blue disc with a yellow disc inside, a red disc with green, and a red star with a blue disc in the centre. In the central green stripe is the sword of Ali. The blade of which is white, and the hilt is coloured. 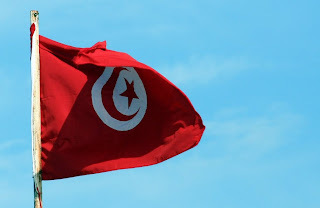 In 1827, the Tunisian fleet was destroyed at the Battle of Navarino, and the leader of Tunisia, Al Husayn ll ibn Mahmud, decided to create a flag for the Tunisian fleet in order to help differentiate them from other fleets. The exact date of which is open to speculation, ranging from 1830, to 1835. However, Al Husayn ll ibn Mahmud took the Ottoman Empire's banner, and used it for inspiration. 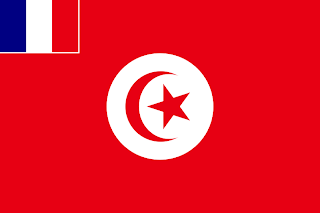 The new banner for Tunisia inverted the colours of the crescent and star, and placed them on a white circle on the centre of the banner. In 1881, the French moved in and turned Tunisia into a protectorate. During France's time as the colonial power, they never moved to alter the flag. However, an unofficial flag came about where the French tricolour was placed in the upper hoist canton of the Tunisian flag. It was never formally adopted. In 1956, Tunisia formally gained its independence from France, and since then, has seen itself run by various authoritarian regimes. However, in 1974, there was a movement to unify Tunisia with Libya. Everything had been agreed, a constitution, a flag, a system of government. However, the idea was completely rejected by the Tunisian people, and combined with eternal, international pressure, the idea never left the drawing board. 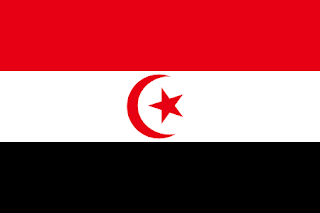 However, the new combined nation would have used the Egyptian tricolour of red, white, and black. And replaced the eagle in the centre with the Tunisian star and crescent. In 1999, the flag underwent a minor alteration, with the crescent being thickened and made more rounded than the previous thinner crescent.